For Russians living abroad Ozon delivers books internationally. But have you wondered how, say, Albanian nationals living abroad source books written in Albanian? During the Startup Weekend in Pristina Elexoj has been created with the intention to solve the problem. It already boasts offering 50 titles of Albanian books for international delivery. The idea may not be ground-breaking in global terms, but it is a sensible business, which leverages financial strength of the Kosovan and Albanian diaspora. For example, according to CIA Factbook, Kosovan diaspora is responsible for 14 per cent of Kosovo’s gross national product, or $740 million per annum. According to Wikipedia, almost a million Albanians left the country between 1989 and 2001 (current combined population of Kosovo and Albania is only 5 million). This is a niche market, but nevertheless one where needs for traditional literature remain unfulfilled. Unfortunately I could not find a sensible flight to attend the event, but as always, Twitter and Facebook did a decent job sharing buzz about the event and its outcome. The runners-up included remote Linux server maintenance tool Sudobase and DigitalNomadPk, which aims to provide travelers with lowest cost prepaid SIM cards in the point of interest as well as inform them about free Wi-Fi hotspots. Khustrim Khakli, one of the most well-known tech entrepreneurs from Kosovo was a judge and a mentor at the event. His company Changers, based in Berlin is the world’s first social energy marketplace. It produces solar energy charging devices for mobile phones and unites its green users into a social clean tech network. I have just received the kit by post, and am waiting for the sunshine to test it out. 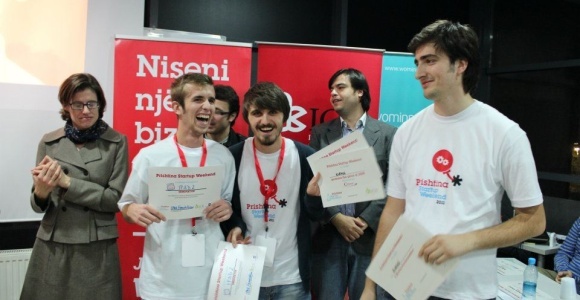 The next Startup Weekend Pristina will take place in April 2012.